In a strongly worded open letter to Prime Minister Narendra Modi the Catholic Bishops’ Conference of India (CBCI) called on him to intervene and “curb the spread of hate created by the BJP chief minister” of Jharkhand state. 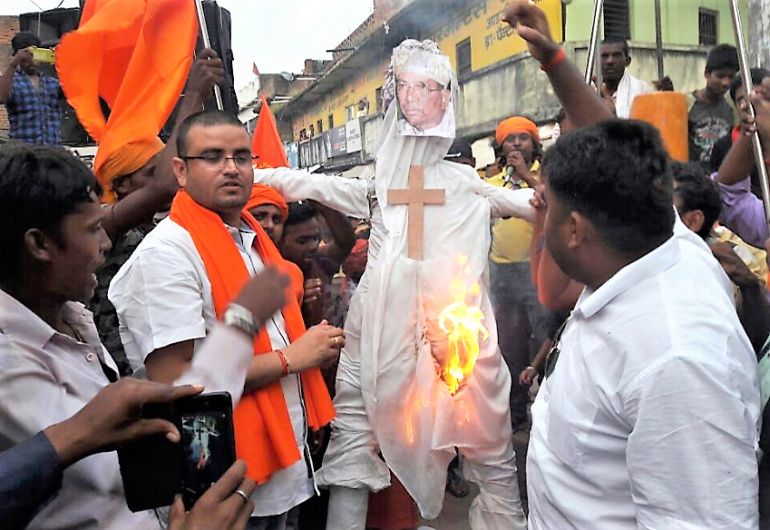 The letter follows the burning of a dummy replica of local Jharkhand Archbishop, Cardinal Telesphore Toppo of Ranchi (former CBCI President), by Hindu radicals last week, AsiaNews reports. Archbishop Toppo had criticised a controversial so-called ‘anti-conversion bill’ before it was pushed through by the state’s legislators on 12 August, despite demands that the bill should be sent to a select committee for further scrutiny. Observers noticed this to be “unusual” and said that it “showed the growing arrogance of Hindu nationalists”. In the letter, CBCI Secretary-General Theodore Mascarenhas suggested that it would be better for Jharkhand’s Chief Minister, Raghubar Das, to step down if he cannot “control this ideological hatred”. 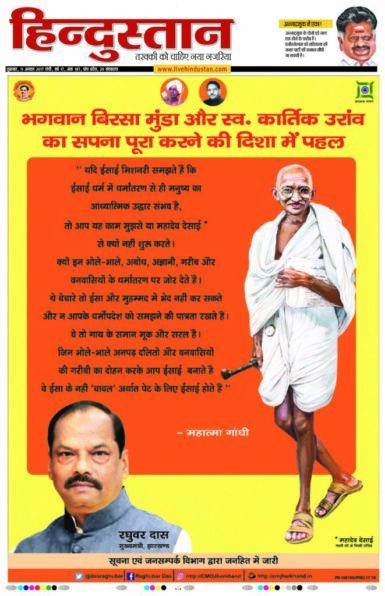 A day before the bill was passed, the Jharkhand chief minister had published advertisements in major daily newspapers, using pictures of Mahatma Gandhi and a quote ridiculing missionaries carrying out “fraudulent conversions” – a quote attributed to Mahatma Gandhi, but whose veracity is questioned by secular groups. The advertisements in Hindi referred to “rice Christians” – inferring that missionaries converted low-caste tribals and Dalits (many of India’s Christians are from the lowest castes) by offering them “rice”, e.g. material benefits. The advertisement referred to members of the lower castes as “simple and mute as cows”. An advertisement in Hindi that appeared in daily newspapers in the Indian state of Jharkhand, ‘quoting’ Mahatama Gandhi’s words on ‘rice Christians’, saying that missionaries were converting tribals and Dalits by offering them ‘rice’, e.g. material benefits. In the letter, Bishop Mascarenhas wrote: “Mr Raghubar Das and his advisors at least in the past few months have not shown affiliation to the ideology you are proclaiming. I appeal to you, honourable Prime Minister, with trust and hope, to intervene and curb the spread of hate created by the chief minister of Jharkhand. Jharkhandis and Jharkhand deserve better”. He also reminded Modi of how the nation had “applauded” him on Independence Day this year when he said that “in the name of faith, violence cannot be allowed”. Meanwhile the National Council of Churches in India (NCCI) also sent a letter to newly elected President Ram Nath Kovind, denouncing the “erroneous, misleading and inflammatory” tone of the advertisement. “The democratically elected government is expected to safeguard and protect the rights of all citizens irrespective of their affiliations… This government has shown by publishing this advertisement that it cannot be trusted and stands exposed of its criminal intentions,” the NCCI said, adding that it believed the government’s intention was “to put tribal people against one another, thereby grabbing tribal land”. Columnist Harsh Mander in the HindustanTimes wrote that “Gandhi must not be appropriated by an ideology that is violently opposed to all he stood for: an India with full religious freedom and equal rights. And it is intensely worrying that taxpayers’ money is used to foment hatred against a segment of people of the state”. He pointed out that only 4.3 per cent of the population of Jharkhand is Christian but that “the political strategy of choice has been to target, defame and intimidate Christians, with violence against their shrines, priests, nuns and women, and with laws that criminalise conversions to Christianity”. Although members of India’s Constituent Assembly took great care to uphold the freedom of religious belief in India’s Constitution, radical Hindu groups like RSS do not acknowledge this fundamental freedom, Mander said. 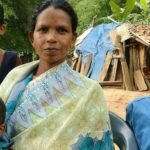 The NCCI in its letter to the President suggested that “the State of Jharkhand should release a white paper presenting the data of … cases of conversion by force, allurement, or threat in Jharkhand in the last 17 years. It is unfair even to think of such anti-conversion law when there are no issues on the ground. 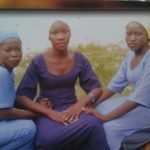 Besides, the Indian Penal Code 295 (a) is already very strong to deal with cases of conversion by force, or coercion, or allurement”. Jharkhand is the eighth state to pass so-called ‘anti conversion’ laws, though in two states they’re not active, while in a third, Himachal Pradesh, parts of the law were repealed after a court challenge brought by the Evangelical Fellowship of India.